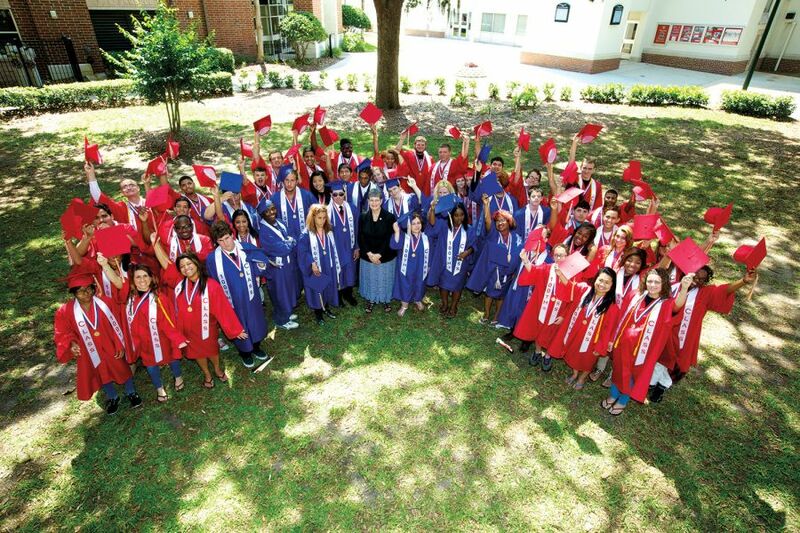 The nation’s oldest city of St. Augustine provides an ideal setting for the Florida School for the Deaf and the Blind, a pre-K and K-12 public school led by alumna Jeanne Prickett. An 18-month-old, born deaf and with limited vision, had no way of understanding her world or being understood. Teachers sat on the floor and worked with her one-on-one, folding her fingers into one word again and again. Two weeks later, when she’d had enough, she signed the word she’d been taught: Finished. A teacher with 30 years experience cried. That’s what happens at the Florida School for the Deaf and the Blind (FSDB), where sixth-graders swim with manatees, the varsity football team routinely beats area high schools and a world-renowned jazz alum attracted a 60 Minutes crew. How they do it is something Jeanne Prickett ’73, M.S. ’77, Ed.D. ’83, explains succinctly: Intensity. Personalized and intense teaching leads to equally inspiring growth for other students at the 130-year-old St. Augustine campus, where 600 children are encouraged to be themselves. Inside the gates of the 80-acre campus shaded by live oaks draped in Spanish moss, it’s easy to feel a part of something that can’t be explained. Students who can’t see ride bikes while the deaf learn dance steps. A blind cross country athlete runs around the track, tapping his cane along the inside rail. During track meets, a sighted runner is tethered to him with a bungee cord. Such accommodations are normal at the fully accredited state public school available tuition-free to pre-k and K-12 students who are deaf/hard of hearing or blind/visually impaired. The school attracts families from as far as Africa, Peru and Russia. Jeanne Prickett was principal of the Hawaii Center for the Deaf and the Blind before leading the Florida school. She was inducted into the College of Education Hall of Fame in 2012. She comes from a long line of women educators. Her grandmother taught college entomology and her mother, Elizabeth Glidden, M.S. ’70, was completing a graduate degree when Prickett started at Illinois State. She wanted to teach high school Spanish until she took a field trip to a special education school program. Her major changed to special education, with a focus on the blind and visually impaired. Evelyn Rex, now deceased, was Prickett’s ISU mentor, who prepared her to work with visually impaired students at Thomas Metcalf School. Some were also deaf from rubella, so Prickett completed a master’s in deaf education. She has never quit learning or teaching. One of her passions is educating others about how a highly specialized environment can increase student achievement. With a staff of 600, there’s almost a one-to-one ratio. An elementary class may have four students, a high school class only 10. Teachers are certified in deaf/hard of hearing or blind/low vision, sometimes both. More than 80 percent of the school’s graduates pursue college or technical training. Prickett is thrilled to have on staff four Redbirds. Middle school reading teacher Maria Williams ’87 was born deaf. Beth (Hopper) Stephens ’96 learned Braille to teach high school history. Ryan Anderson ’80 is a high school individualized program specialist, and Carrie Marvin ’03 oversees facilities at the school that offers extracurriculars comparable to any other high school. Jeanne Prickett is surrounded by the graduating class of 2013. From athletics to yearbook and student government to the performing arts, students are engaged. They have performed at a Super Bowl half-time show, and the Eyes Alive! Deaf Elementary Theater program produced two movies in sign language. Students prepare for life after graduation through apartment-style living their last year on the campus, which has 24-hour health care and its own state-authorized police force. Children can enroll as early as preschool. The Early Learning Center, which includes a Montessori preschool, serves about 30 children. Some get on the bus as early as 6 a.m. to get there. 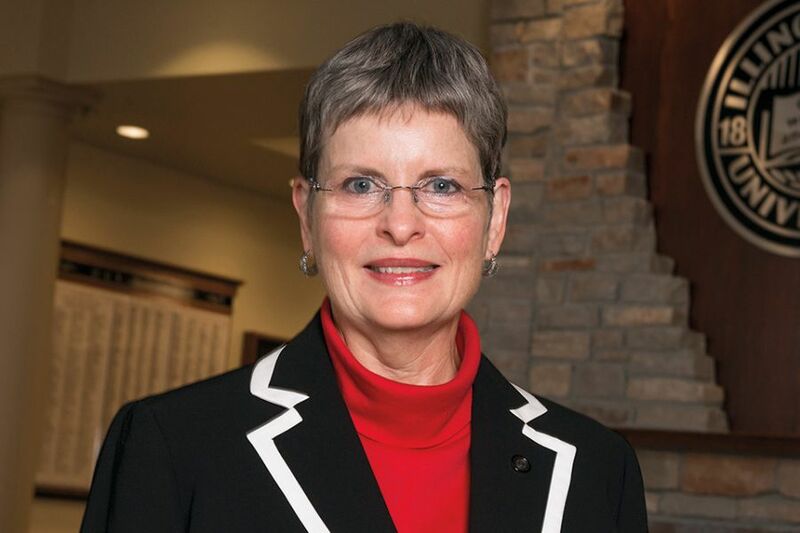 She’s grateful for Prickett’s leadership and her commitment to whatever is in the best interest of families. Prickett has a single goal—to increase student achievement—which means preparing students for a lifetime of independence. Prickett served as principal of the Hawaii Center for the Deaf and the Blind before leading the Florida school. She immediately felt the fit, as did the staff and community, said retired FSDB principal Joe Finnegan. One of the first things Prickett did was move the president’s office inside the gates. She walks the grounds, interacting with the students. When she stopped to sign with a high-schooler from another country, she noticed he was using more facial expressions than when he arrived. Stopping into a music rehearsal, she carefully listened to visually impaired students sing. She realized a student on pitch six months earlier was off key. Because that can indicate a hearing loss, she notified the director. And always on Fridays, as students head to charter buses that will take them home, as far as seven hours away. She stands nearby and speaks to the students as they pass. A grade-schooler signs “I love you.” A blind 13-year-old searches for his bus. “I will take you there,” she said, folding her arm into his. Such moments reinforce her commitment. Although her peers are retiring, she’s not going anywhere. There’s no reason to.